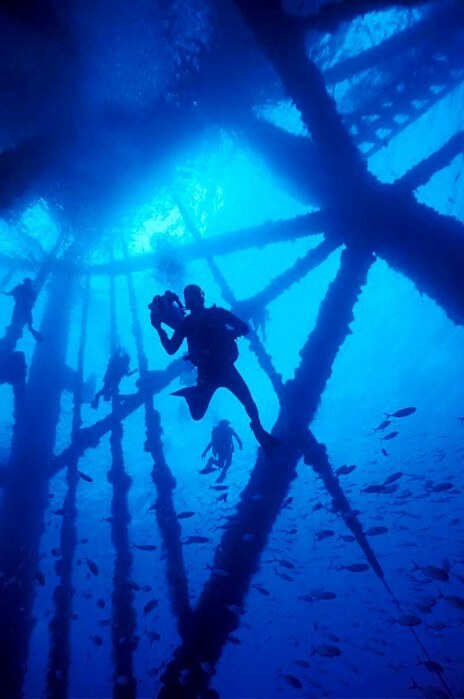 Divers descend into a deep water oil rig in the Gulf of Mexico. Once the bane of environmentalists, these rigs have become so important to the commercial and recreational fisheries of Louisiana that the state now offers incentives to the oil companies to keep the rigs in place when they cease to be productive for oil. The rigs off the coasts of Louisiana and Texas form one of the most extensive conglomerates of artificial reefs in the world.